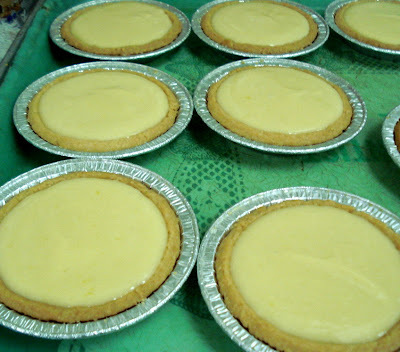 Now that I'm working, making tarts has become one of the things I enjoy the most. Since I decide about the menu, I serve 3 different tarts in a week. Here's one that has become popular among my customers. Add the eggyolk and mix with a spoon. Lastly, add vanilla. Mix to make a soft dough. Knead for a bit to have nice smooth dough. In a lightly floured work surface, roll out the pastry until it is 2.5 mm thick. Line a round aluminum tart tin. Trim off the excess. Prick the base with fork. Chill. Bake at 170 degrees C for 25 minutes or until golden brown. Chill. Soak the gelatin leaf in cold water. Place the gelatin over a saucepan of simmering water. Set aside. Place the lemon juice, eggs and sugar in a bowl. Beat until light and creamy. In the same saucepan where you melt the gelatin, cook the lemon mixture until it reaches 71 degrees Celcius. Remove from heat, add the butter. Mix until the butter melts. Lastly, add the whipped cream into the lemon mixture until well blended. Pour the lemon filling into the tart shell.